Are you an adult with misaligned teeth who would love to have them straightened, but the thought of getting metal braces has prevented you from doing so? Or, do you have a teen with crooked teeth, but they would literally die if they had to wear braces? Fortunately, dentistry has developed the perfect solution for people in these situations: Invisalign. It’s a treatment designed with older patients in mind, able to help them get a straighter smile without compromising their daily appearance. Instead of metal brackets and wires, Invisalign instead uses a series of clear plastic aligners that simply fit over the teeth. Like braces, they apply a gentle but consistent force that slowly brings the teeth into their correct positions. It’s subtle, it’s discreet, and it’s proven to fix crooked, crowded, and gapped teeth, often in much less time than traditional braces. Read on below to learn more about why our patients love Invisalign! Convenience – The clear plastic aligners can be removed when needed. This means you can eat the foods that you love and then, after eating, brushing, and flossing, simply pop the aligners back in. Easy Tooth Care – Since you can remove the Invisalign braces, patients can continue to floss, brush, and use your regular dental hygiene routines and practices. This reduces the risk of tooth damage that was often seen with traditional types of braces. Comfort – Without any metal wires and bulky attachments to the surface of the teeth, there is less irritation to the cheeks, lips, and tongue. 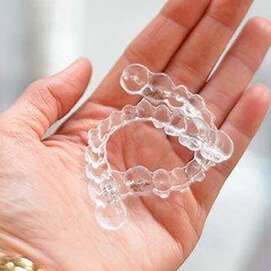 Fewer Dental Visits – Invisalign aligners are pre-set! You just use a new set every few weeks to slowly move your teeth into the correct position. There is no need for regular weekly adjustments or dental visits. In most cases you will come in to see Dr. Hutto about every six weeks for progress reports and a quick check-up. We have provided Invisalign clear braces to Baytown patients for many years. Dr. Hutto is a leading provider of this revolutionary orthodontic treatment in Baytown, TX and continues to use only cutting-edge technology in treating patients and helping them to get the smile they always wanted. One of the most amazing features of the Invisalign technology is that we create a 3D image of your mouth prior to starting the treatment. From this image, you can see your existing teeth and also a model of how you want your teeth to look after treatment. This image is then sent to a lab that creates your unique sets of aligners. 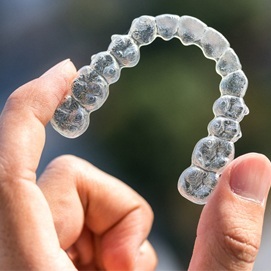 Typically, most patients, depending on the type of correction required, will use the aligners for a period of one to two years, changing them out every two weeks to gradually reposition the teeth. Invisalign clear braces are a newer technology, which means many people have questions about their process. 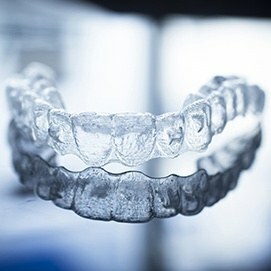 While you’re probably be familiar with traditional braces, you may want to know more about Invisalign treatment and what your day-to-day with these clear aligners looks like. At Aesthetic Family Dentistry, we provide personalized treatment plans to all of our patients, ensuring a successful and smooth process. Read on to learn more how we use Invisalign to give our patients a straighter smile with comfort and confidence.